George Anderson, owner of the Yellowstone Angler fly shop, has annualized a 5-weight shootout that has captured the attention of the fly fishing industry, fly angling publications and fly anglers worldwide. The contenders. Image by Yellowstone Fly Shop. Interestingly, if you look at the bottom line from the last 2015 shootout, it is very similar to the 2016 edition. 1. Incredibly, the G. Loomis NRX LP wins again, but against some very stiff competition from the Scott Radian, the new Hardy rods, and the new Tom Morgan Rodsmiths 4-pc. 2. The Scott Radian is again the 2nd place pick in a very tight finish. 3. 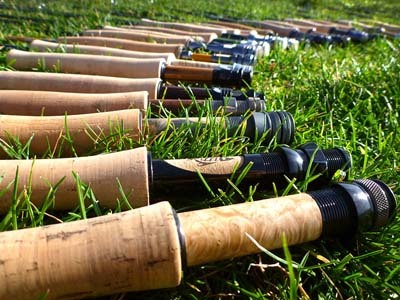 The Douglas DXF at $349 is still the favorite mid-priced rod in the $300-$450 range. 4. The Fenwick Aetos remains the best inexpensive rod at $189.85 while Echo’s new Base model at $89.95 offers a decent rod under $100. Read complete evaluation here . . .